These devices contain two independent D-type SN74S74 positive-edge-triggered Flip-Flops A low level at the preset or clear inputs sets or resets the outputs regardless of the levels of the other inputs. When preset and clear are inactive (high), data at the D input meeting the setup time requirements are transferred to the outputs on the positive-going edge of the Clock pulse. Clock triggering occurs at a voltage level and is not directly related to the rise time of the Clock pulse. Following the hold time interval, data at the D input may be changed without affecting the levels at the outputs. The SN54' family is characterized for operation over the full military temperature range of -55C to 125C. The SN74' family is characterized for operation from 0C to 70C. This is one package pinout of SN74S74,If you need more pinouts please download SN74S74's pdf datasheet. 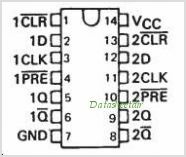 SN74S74 circuits will be updated soon..., now you can download the pdf datasheet to check the circuits!